White Snakeroot is a poisonous plant that is native to North America. The plants are tall and can grow 3-4 ft. in height. Snakeroot’s white flowers are born at the top of the plant in loose clusters that might remind you of boneset or a white ageratum. The substantial leaves of the plant are opposite, ovate to cordate, and toothed, with long petioles. 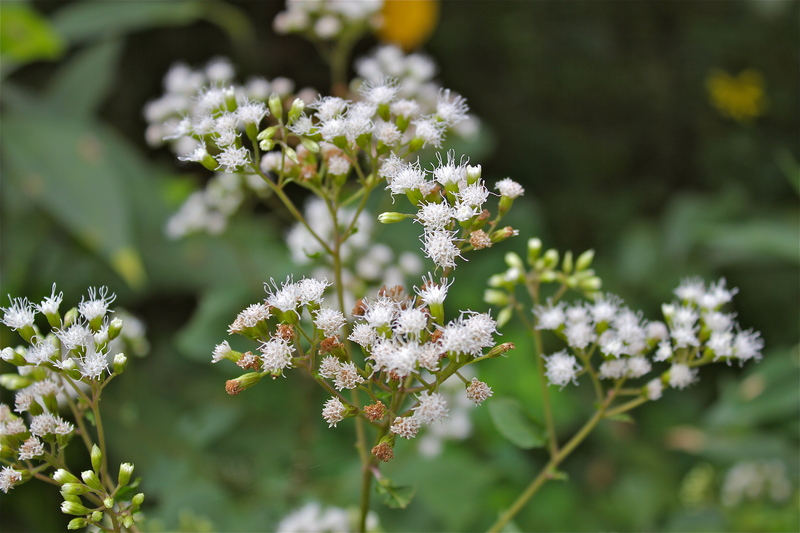 White snakeroot is responsible for a kind of human poisoning called “milk sickness”. People who drink the milk or eat the meat of cattle that have consumed a lot of snakeroot will suffer severely and may even die as a result of the toxin (tremetol). Thousands of early settlers who were unfamiliar with this plant died as a result of milk poisoning. The plants are also poisonous to other animals, including horses and sheep. Surprisingly, the plant gets its name from the fact that it was once mistakenly believed to be a good remedy for snakebites. Snakeroot is a perennial herb that likes to grow in moist, shady places. I found these plants growing at the wood’s edge, in partial shade. Some of the photos were taken near the floodplain of Tom’s Creek in Blacksburg, Virginia, and the rest were taken at Grayson Highlands State Park. Bloom time for this plant is late summer and fall. Other common names include tall boneset and white sanicle. There is lots growing in Staten Island, NY…. It’s a rather unwelcome visitor in my garden. Pretty but quite invasive.